We’ve all seen those touching relationships between two things don't logically go together, like Bubbles the elephant and Bella the black Labrador, who play together incessantly on a U.S. safari reserve, or best buds Torque the dog and Shrek the owl, an unlikely duo of inseparable pals ever since Shrek was orphaned at 6 months old. We can now add Griz and Tabby to the list of improbable pairings. In this video from Wildlife Images Rehabilitation Center, we see them explore one another, establish a peaceful detente and move into the beginning of a lifelong friendship in the adorable video below. Griz, a large adult grizzly bear who was orphaned and severely injured as a cub, seems to have a follower walking a parallel track through the forest with him. This follower is Tabby, a bright orange cat abandoned at just a few weeks old. She’s hungry and afraid of humans, which may have compelled her to seek out an unlikely companion in Griz. She’s at first cautious, staying beside him, but still at a distance. Later, they begin to interact. Griz shows normal grizzly curiosity and seems eager to check out this potential new friend. Tabby’s body language indicates she’s no threat, and soon, a fortuitous friendship is born. According to BearSmart, bears naturally react to new things in their environment, and a new situation or object can often frighten a bear. This behavior has been defined by behaviorists as “strange object response.” While a bear may feel an initial sense of fright and appear to be aggressive, it quickly calms down and sets about investigating the new thing. 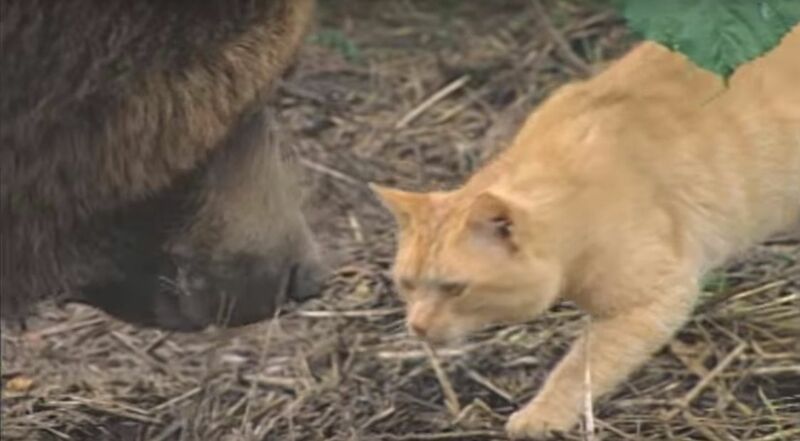 In the video, Griz’s reaction to Tabby was likely because of his awareness of something new in his environment and an innate need to determine if Tabby was a threat, or a food source, or something completely harmless. Grizzly bears are social among their own, coexisting peacefully with one another, forming friendships and alliances and even mentoring orphaned or younger cubs. 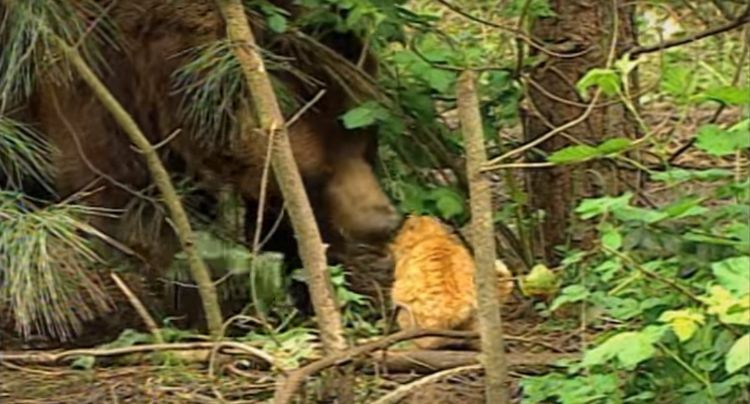 Grizzlies often do not bond with other animals, but there have been several reports of unusual social relationships with other species, including another cat-grizzly friendship at a zoo in Berlin, Germany. To the surprise of the staff at the 24-acre sanctuary, Griz and Tabby formed a bond, and they have often been observed eating together, playing together and napping together in what has become a lifelong relationship. Check out the video below, and SHARE it if your like it. Hugo calls the Alaska Wildlife Conservation Center his home. He was found as a cub in 2000 and still seems just like a child today. This huge bear is a dab hand at catching food in his mouth. Check it out!